01/18/2019 - The Hershey Bears announced today that the club has signed forward Jordan Samuels-Thomas to an American Hockey League contract, and assigned him to their ECHL affiliate, the South Carolina Stingrays. 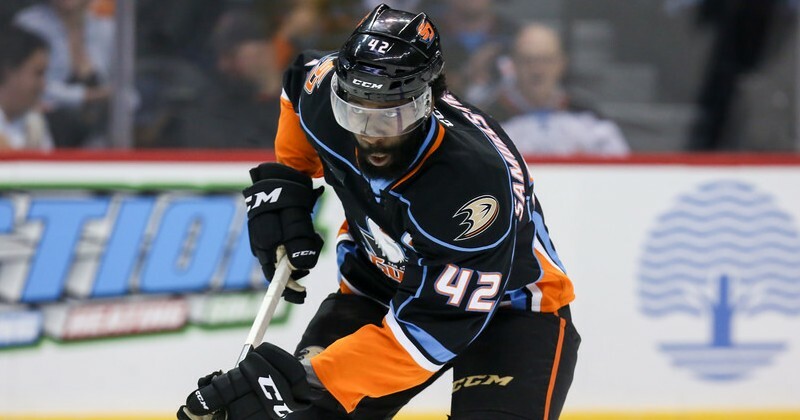 Samuels-Thomas, 28, has 195 games of AHL experience, most recently skating with the San Diego Gulls in the previous two seasons. He posted a career-best 24 points (12 goals, 12 assists) in 56 games with the Gulls in the 2016-17 campaign. In his AHL career with Rochester, Ontario, and San Diego, Samuels-Thomas has scored 56 points (28 goals, 28 assists) and 151 penalty minutes. The 6-foot-4, 210-pound forward has 11 points (two goals, nine assists) in 17 games with Medvescak Zagreb of the Austrian Hockey League (EBEL) this year. Prior to turning pro, the West Hartford, Connecticut native played two years of NCAA action at Quinnipiac University from 2012-14. With the Bobcats, he posted 29 points in back-to-back years, and played under the direction of former Hershey Bears and current Washington Capitals assistant coach Reid Cashman. Samuels-Thomas was originally a seventh round selection of the Atlanta Thrashers in the 2009 NHL Draft. He has also appeared in 10 career ECHL games, collecting eight points.